Katie Lavender has always thought she was pretty unshockable, until a year after her mother's death she receives a letter from a solicitor telling her that the man she thought was her father, in fact wasn't. Her real father, a man named Stirling Nightingale, has for years been building a trust fund for her. And now she's of an age to collect it. But Katie's not interested in the money. She wants to know about the man instead. So decides to do some snooping. She tracks him down to a beautiful riverside home in Surrey on the night he's hosting a birthday party for his 90-year-old mother. And as she's hovering outside, Katie is mistaken for a replacement waitress. It's too good an opportunity to turn down, so Katie sneaks inside to take a close look at the father she's never known. 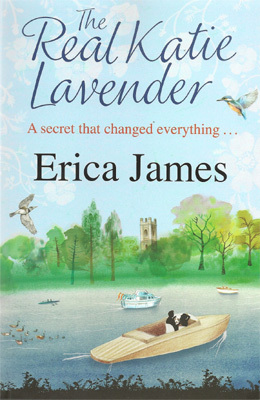 With an insatiable appetite for other people's business, Erica James will readily strike up conversation with strangers in the hope of unearthing a useful gem for her writing. Erica divides her time between Cheshire and Lake Como in Italy, where she now strikes up conversation with unsuspecting Italians.